The Jim Moran School of Entrepreneurship offers a diverse and wide range of internship possibilities for Commercial, Social, Retail and Product Development businesses and non-profit organizations. Internships are designed to expand the knowledge students have gained from the classroom and applying it while enhancing needed skills in a professional business or non-profit organization. Opportunity to ensure an internship in the industry that matches the student’s interest. Opportunity to test drive a company, position and location that the student is interested in. Hands on learning experiences from experts in business. Strengthening leadership and management skills that will be transferable to one’s own business one day. Opportunity to build a reputation, brand and network. 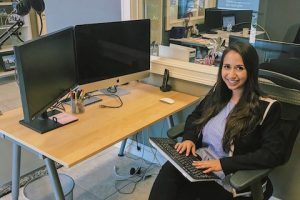 No matter where the student’s interest and skills lie, an internship is key in giving an edge in growing professional and personal values, strengths, and readiness to begin a journey.